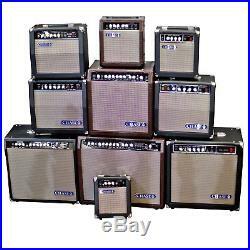 Chase Guitar Amplifiers Available for Acoustic, Bass & Electric Guitar. The Chase Guitar amplifiers are great amps for beginners to make the next step up to from their first entry-level amplifier, or for intermediate players who simply want a cracking sounding amp for home practice use or for gigging on stage at an affordable price. Loaded with features including full control over your bass, middle and treble, overdrive distortion switch, CD/MP3/iPod input, and a headphone output for those late-night practice sessions, these amps kick out a surprisingly large amount of power from their internal speaker, s and is of extremely solid build quality. Fitted with a carry handle on top and protective rubber grip feet on all fours, Chase Electric Guitar Amplifiers are impressive amps for enthusiastic guitarists. Guitar Amps are a key part of a guitarists rig. Many people believe that the amp is as, if not more, important than the guitar in forming your unique sound as a guitarist. Chase Produce a wide range to suit all types of players. Combo Amps are ideal for those who want an all in one solution. While combo amps will have tonal controls and some effects, the sound can be changed further by adding pedals in the chain. Combo amps are also straightforward, being plug in and play. Chase Electric Guitar Amplifiers offer a wide range of tones. From very clean sounds to heavy overderive, these amplifiers provide a wide spectrum of noise All chase electric guitar amplifiers feature an overdrive switch to select between Clean Sounds and Distortion. The CA-60B can also be switched with on optional footswitch. All Chase Electric Guitar Amps Provide A Headphone Output for silent practice. 2 Band EQ Clean Ch 3 band EQ Dist CH. Channel Select via Footswitch (optional) Effect Send/Return. 8cm x 25cm x 25cm. 36cm x 21cm x 31cm. 40cm x 21cm x 34cm. 53cm x 28cm x 48cm. CA10G 10 watt Electric Guitar Amplifier. CA20G 20 watt Electric Guitar Amplifier. CA30G 30 watt Electric Guitar Amplifier. CA60G 60 watt Electric Guitar Amplifier. Chase bass Guitar Amplifiers give you everything you need, in one portable and easy to use set-up. Combo amps are ideal for first time bass amp buyers and those wanting a full upgrade of their amplification system. Much easier for gigging than a separate cab and head, Chase bass combos give you a wide range of sounds and easy access controls. 30cm x 29cm x 18cm. 40cm x 36 x 19cm. 52cm x 47cm x 26cm. CA15B 15 watt Electric Bass Guitar Amplifier. CA30B 30 watt Electric Bass Guitar Amplifier. CA60B 60 watt Electric Bass Guitar Amplifier. Chase Acoustic Guitar Amplifiers are highly optimised to reproduce the sound of your electro Acoustic Guitar. All Chase Acoustic Guitar amplifiers feature a chorus effect. A separate Combo Microphone input can be found on the CA30A and CA60A Acoustic Guitar Amplifier models to plug in a dynamic microphone and amplify your Voice. 2x 10 + 2x Tweeter. Tone Control for Mic Input 3 Band EQ With Parametric Mid For Guitar 5 Band Grafic Master EQ. Microphone Combo Input Socket (XLR/Jack) Adjustable Chorus. Microphone Combo Input Socket (XLR/Jack) Fully Adjustable Chorus 2x Speaker Output Effect Send/Return. CA15A 15 watt Acoustic Guitar Amplifier. CA30A 30 watt Acoustic Guitar Amplifier. CA60A 60 watt Acoustic Guitar Amplifier. IT'S CHEAPER AT CHASE. All our pianos are inspected by our staff. They personally go to manufacturers and factories to ensure that the pianos are manufactured to the highest standards. We pride ourselves on giving you the best deal by importing directly from manufacturers under our own brand name of CHASE. We give you the pick of the world's best musical instruments at virtually wholesale prices! It's Cheaper at Chase. The item "Chase Guitar Amplifier For Electric Acoustic Bass Amp Practice Combo Reverb Fx" is in sale since Friday, February 12, 2016. This item is in the category "Musical Instruments\Guitars & Basses\Guitar Amplifiers". The seller is "chasedirect" and is located in uk.